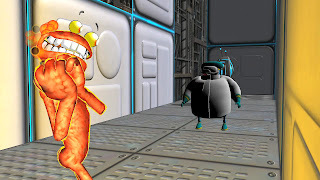 Microsoft kicked off it's Xbox Live "Summer of Arcade" with the newest infectious title from Twisted Pixel Games (The Maw). 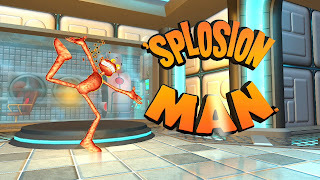 'Splosion Man marks the second game from Twisted Pixel to release on the XBLA, and they've done a tremendous job or making a fun, increasingly challenging and simply unique game. 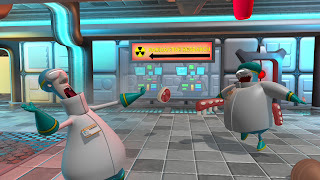 I've spent hours with the game now, and am still enjoying the 'Splosion Man character, as he runs down the level, arms outstretched and making airplane noises chasing after the unarmed scientists. The game is a simple platformer, but with a twist. Your character can "splode" himself, causing him to "jump". He can do so three times before needing to rest. 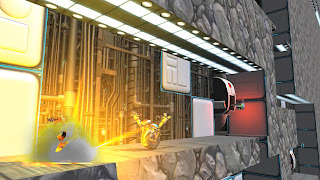 Using this triple-jump mechanic, you 'splode your way through over 50 single-player levels (and 50 multiplayer levels), and some incredible boss fights. The gameplay is deceptively simple, but there are some steep areas in which to pass. Luckily, they offer you a "Way of the Coward" option, in which if the game senses you're having trouble passing a section, you can "skip" it and go onto the next. Always a welcome sign so as not to discourage players who may not be as deft with their timing and 'spolosions. If the rest of the Summer of Arcade is as good as this, we could be so lucky. As far as Twisted Pixel - they're quickly earning a reputation for fun, clever games that everyone can enjoy. Well done!